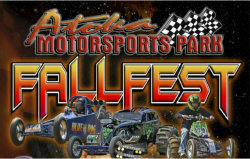 Atoka Motorsports Park in Atoka, Oklahoma will be hosting the Fall Fest event on October 13-14. This event will be a celebration for the 25th year of sand drag racing at the Southeastern Oklahoma facility. Championships will be on the line at this race as both the Mid-America Challenge & Atoka track point series will wrap up their season. Read on to view the full event details & flyer. 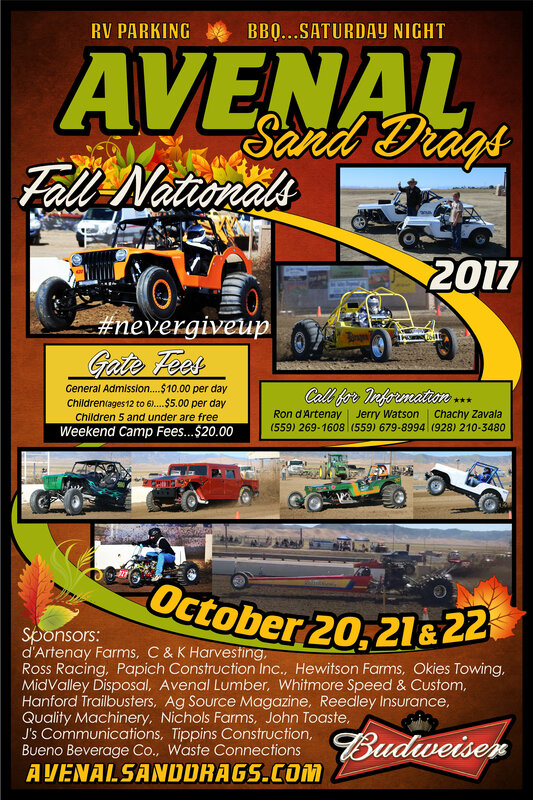 The 2017 Avenal Sand Drags Fall Nationals is upcoming on October 20-22. This will be an action packed 3-Day Event. The event schedule is listed below, please take note that the 3.95 Index & Motorcycle Gambler classes have been added to Friday. 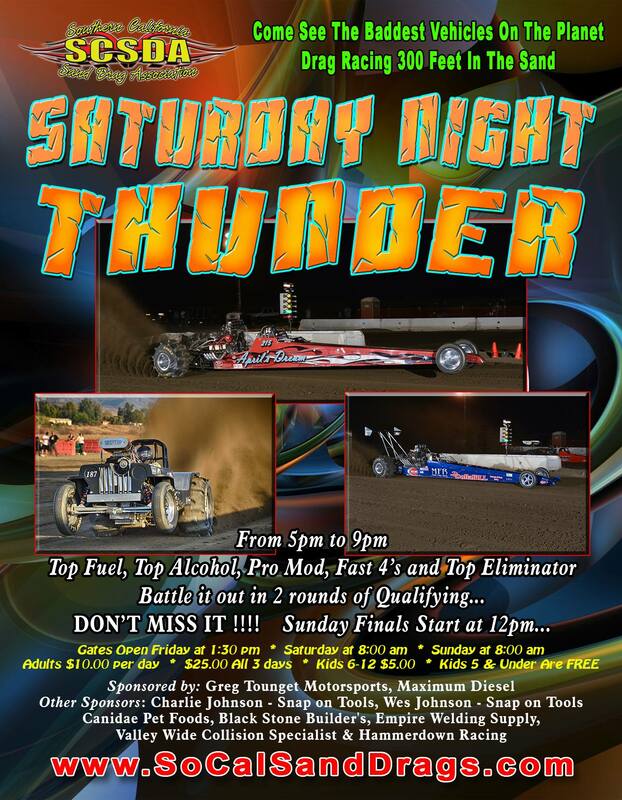 Avenal Sand Drags has decided to sweeten the pot for this event. The listed payouts below are Guaranteed PLUS the normal Avenal Sand Drags payout. 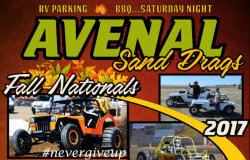 A huge thank you goes out to Avenal Sand Drags, Inc., #NeverGiveUp, Ross Racing and Hammer Down Racing for making this possible for the racers. Full event info is listed below. 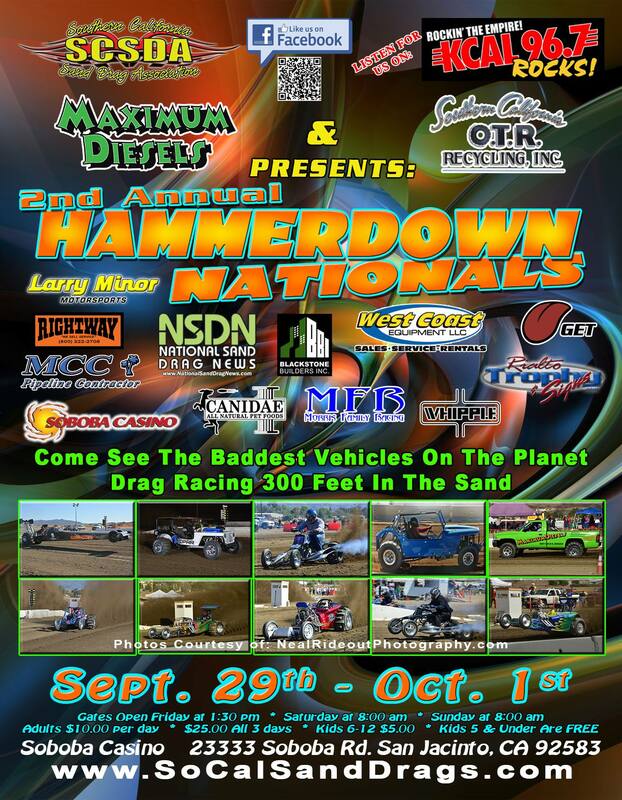 Check out this great commercial for the SCSDA Hammer Down Nationals. The voiceover is the Radio Ad that will be run on the local KCAL 96.7 radio station to promote the event. In other Hammer Down Nationals news, more GUARANTEED payout info has been released. The first place payouts are listed below. Excell Raceway in Bouckville, New York will be the site of a major event on September 23-24 with the Eastern Grass Drag Nationals taking place at the facility along with the MRA Kelly O'Dell Memorial Mud Drag Nationals. The event promoters are inviting sand drag racers to participate on the same 200’ Dirt Drag "Fast Track"-style track that the MRA racers are competing on. The track is 200’ long with 800’ of shutdown area and uses professional Portatree timing equipment. Guaranteed Payouts are in the works for at least two categories, preliminary thoughts are for 2.30 (2.95 in 300’) and 2.75 (3.50 in 300’) side-by-side Index categories. Other classes may be added based upon interest. Contact Brian Davoli at 315-868-5884 for more info in participating at this event. Click "Read More" to view full event flyer.